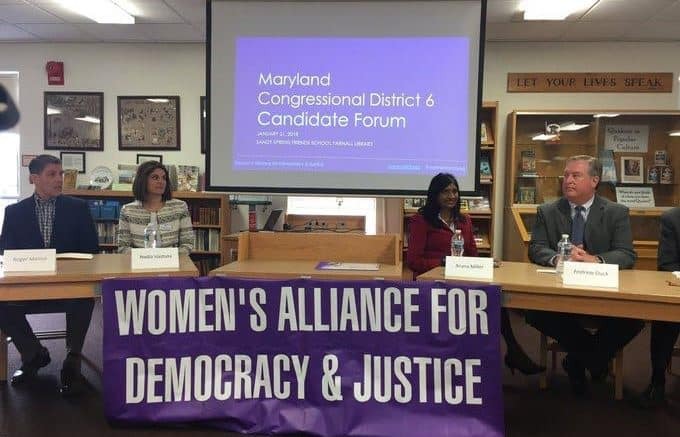 Six candidates running for Maryland’s 6th Congressional District- five Democrats and 1 Libertarian – participated in a candidate forum on Sunday, Jan. 21, at the Sandy Spring Friends School library, sponsored by the Women’s Alliance for Democracy & Justice and Diversity Matters. Sandy Springs Friends School sits outside of the boundaries of the 6th Congressional District. The goal of the Women’s Alliance for Democracy and Justice is to educate people and to inform voters about process and candidates. The forum was moderated by Chris Lock. The following candidates participated in the forum: Libertarian Kevin Caldwell and Democrats state Sen. Roger Manno (D-19), Dr. Nadia Hashimi, Del. Aruna Miller (D-15), Andrew Duck and David Trone. Republican and Libertarian candidates running for the 6th Congressional District were uninvited to participate in the scheduled forum; however, the hosting organization(s) extended Caldwell an invitation after several of Caldwell’s supporters contacted the organization(s) requesting Caldwell’s inclusion. A Miner Detail has video.